Few months ago, my friends from Dinamic Crochet Group asked me to be involved in the charity group based on squares crochet/knit. The idea is, mbak Thata made the pattern and everyone can get the pattern for free as long as they sent 2 squares in return to the group. Then we have 2 people who will assemble the squares into the final products. We will give the products to others who need it. At first, we planned to make blankets. 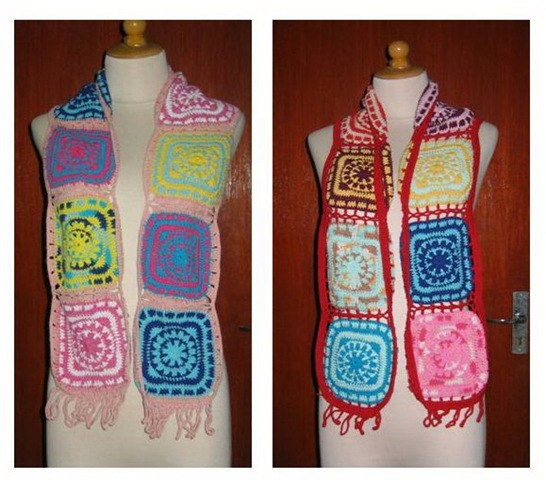 But since blankets need many squares then we changed our mind to make scarves. From the squares that we received on the first months, we made 4 scarves. 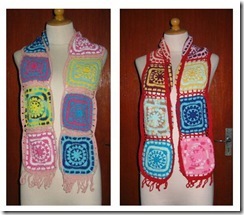 I sent 2 squares to Indonesia and my friend Katrien over there assembled it in to the scarf. Before we have the opportunity to deliver the scarves, we were introduced to a Free elementary school in Bandung. This school is provided for the students whose parents cannot afford to pay the school fee. We realized quickly that, the students must need school bags, and having new school bags in the beginning of the academic year will make them very happy. We decided to postpone the scarves project and concentrate on making school bags. I sent 2 big squares and 2 small squares already. Right now my friend Fenny already assembled my big squares into a school bag. 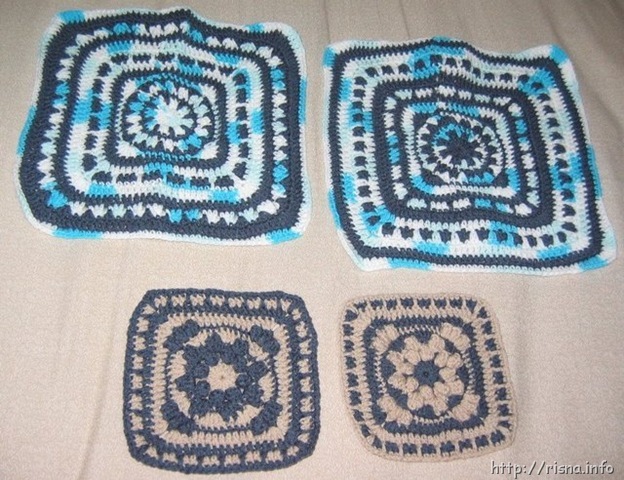 Anyway, making squares did not take so much of my time, and I started to enjoy making squares. 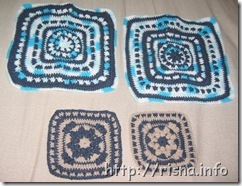 Even tough I’ve never planned to make an Afghan for myself from the squares, I just love make a few squares. Knowing that from 1 or 2 squares I sent, someone will make it as products that will be useful for others makes me feel happy. Few days ago I found another charity square projects. 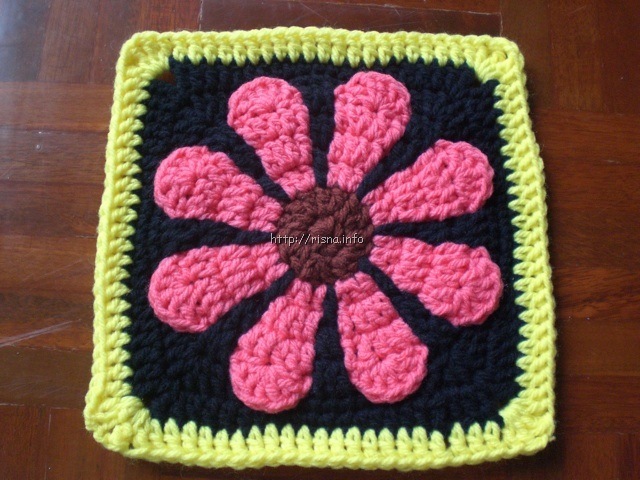 The square pattern is also beautiful and making it a little bit tricky. In curiosity, yesterday I made it and when I finished, I felt like WOW..it’s not that hard. 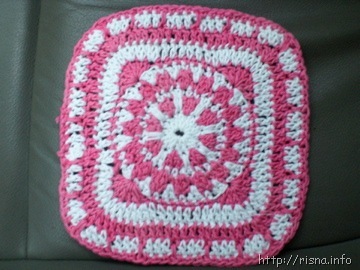 I learned new tricks on crocheting while making this squares. And today I posted it from Chiang Mai Thailand to USA. I’m glad the postal cost is still acceptable (just about 2 USD). Now, I am planning to make another bag from the squares for myself and I am also looking for another square based charity group to make. It is a happiness for me when I can make small things that can make others happy. 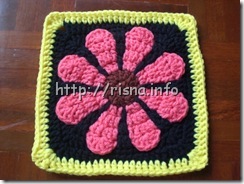 I learned many new things in crocheting from making those squares from both charity groups. 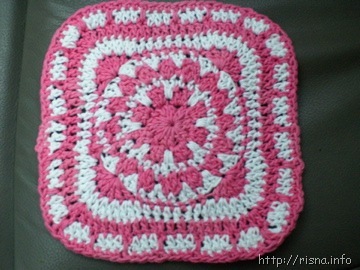 I would like to help with the squares, but I only make the simple Granny squares. I have crocheted for years and make simple things. Would you be interested in my squares. I do work the ends in real good. 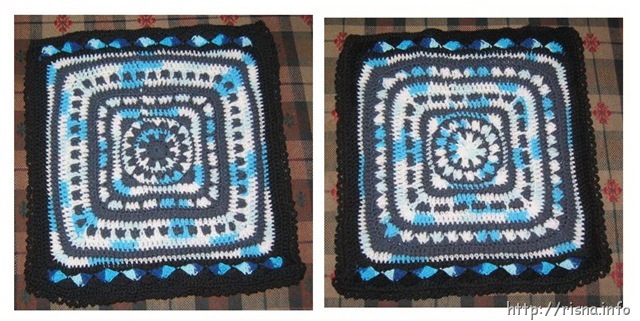 I think these squares are lovely and would love the pattern.